At one point it was 65-26 while the crowd waited for a bout to begin. Much later, with 7:31 remaining in the contest, one team ran jams of 20, 14 and 4, taking the lead for the first time all night, 137-130. Then, at 1:42, the fan base in KeyArena standing and screaming encouragement to their teams, the Sockit Wenches were ahead 140-134 and looking at a win over Grave Danger in the opening bout of the 2015 Rat City Rollergirls season at KeyArena. 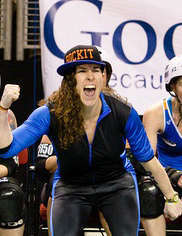 You have to play every jam, including the final when Wenches jammer Sun Shiner (#36), she who led her team with 47 points, was called early for cutting and sent to the penalty box. Soon there were three more Wenches skaters in the box. Grave Danger jammer Nehi Nightmare (#48) grabbed 15 quick points against sparse blocking and the team that bills itself as “Your Worst Nightmare” turned out to be exactly that, winning 149-140. Grave Danger was tough early, often and late. The Sockit Wenches were tough in stretches, they just didn’t have enough of them. After six jams Danger led 53-7. Both team were sorting out players, changing lines, sending their stables of jammers to test the walls of muscle ahead of them. It just didn’t make much difference which line up of blockers and pivots Danger Coach Vito Ramon put on the track, they were all impenetrable as far as the Wenches could tell. Rodger That (#789) and Tempura Tantrum (#99) helped throw a shutout in jam one. 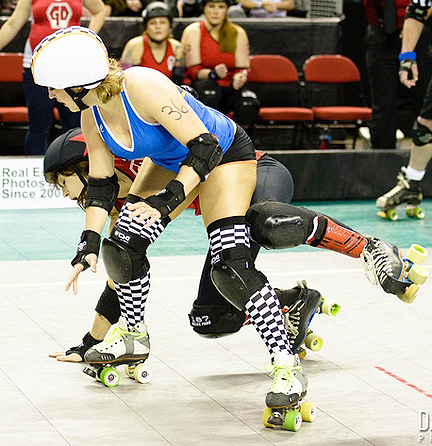 StunHer (#316), Muffstache (#17), Ponyo Knees (#81) and Loco Chanel (#37) were the interchangeable vets well practiced in the strategy of roll ’em down the line, bounce ’em off the track and recycle ’em so far back that the locker rooms are closer than the pack. But there were two teams in this bout and Wenches blockers Sister Slaughter (#480), Clobberin’ Mame (#440), Moe YaDown (#14) and Fatal Fenix (#78) began to throw some zeros or their own on Danger jammers. Winter Scoming (#1221) picked up ten for the Wenches. Sun Shiner took the lead in three steps and added another nine before a back block gave her a penalty time out. 53-26 after eight jams. Danger put the clamps on after that spurt and there was no more scoring by the Wenches for the next eight jams. Trailing 67-26 Sun Shiner slashed for 20 in jam 15. Sister Slaughter, with that unexpected grace you never get used to, waltzed through the Danger blockers for five, then came around for another scoring pass that included removing Muffstache with a crushing hip as she passed for four more. It was 69-55, looking more like the close contest it would become in the second half. Both sides skated tight, quick call jams to open the second half. The Wenches trailed 66-84 but chipped away while frustrating Danger jammers, closing the gap by jam six to 82-88. Nehi Nightmare and J Killa (#425) wouldn’t go away, however, and Grave Danger kept their lead, pushing it to 130-99 by jam 15. Nehi, whose small stature helps her avoid hips and shoulders coming in somewhere above where they could do any damage, lost that advantage while picking up four points in jam 9. Moe YaDown, as Nehi picked a passing lane by her, got low enough, aimed her shoulder and sent the jammer tumbling off the track. That defensive move prevented another scoring pass, keeping the Wenches within striking range. In jam 16 Vishus Trollope (#106) was quicker to the open lanes than the Danger blocking crew for four straight passes. Her 20 points closed the score to 130-119. Sun Shiner took advantage of Danger blockers caught up amongst themselves to add 14 more in the next jam. Sher Nobyl (#5) and Ginger Brute (#7334) put an absolute stop on Danger jammer Ponyo Knees and the Wenches were suddenly ahead for the first time in the bout 133-130. It got pretty crazy in KeyArena. Grave Danger is a veteran team. After four jams stuck at 130 and three more at 134 they took the track for the final jam with the same swagger they wore when the bout began. Trailing by six wasn’t a number they couldn’t overcome. Within seconds of the whistle blowing to start the final jam another blew to send Wenches jammer Sun Shiner to the penalty box for cutting the track. Then Mad ScrapHer was called for destroying the pack, soon joined by Vishus Trollope for a high block. More Wenches off the track than on. Nehi Nightmare made three passes, her 15 points more than enough to give Grave Danger the 149-140 win. “I thought we had it,” said Sockit Wenches Coach LeBrawn Maimes. “I couldn’t be more proud of this team. They have put in so much work. Our vets truly stepped up tonight,” she added. Grave Danger scoring was led by Nehi Nightmare with 48, followed closely by J Killa, 46, StunHer, 35. Aalto Ego chipped in 2, Jess Cuzz had 14 and Ponyo Knees 4. There was enough passing of the star during some jams that these numbers aren’t being guaranteed. For the Sockit Wenches Sun Shiner had 47, Winter Scoming, 32, Vishus Trollope, 31. Other points were added by Oh So Final, 16, Sister Slaughter, 9, and Mad ScrapHer, 5.